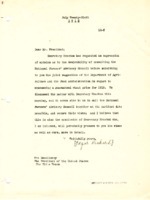 Title is exactly "Edgar Rickard to Woodrow Wilson"
Edgar Rickard responds to Woodrow Wilson’s letter regarding fixing the price of wheat asking to arrange a meeting with the Department of Agriculture and the National Farmers’ Advisory Council. 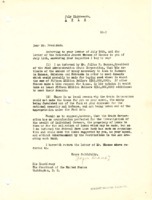 Edgar Rickard writes to Woodrow Wilson about signing an Executive order regarding regulations for breweries. Edgar Rickard responds to Woodrow Wilson’s letter about the Honorable Jouett Shouse’s request of a loan for the Grain Corporation.